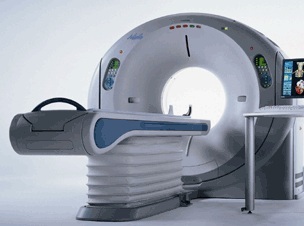 The Toshiba Aquilion 64 mobile CT is considered the only true volumetric 64-slice CT scanner with 64 detector channels, 3-D cone beam algorithms and volume reconstruction on the market. Created with proven performance and uncompromised speed, the Aquilion 64 CT is twice as fast as a 32 detector row CT system and comes with workflow-enhancing software that delivers unsurpassed image quality, improved dose management and superior patient care. In just a single breath hold of 6 to 10 seconds, this mobile CT system can capture superior, precise images of the heart to help early detection of heart disease. Its SURECardio and SUREWorkflow packages also monitor the patient’s heart rate and automatically set the optimal scanning conditions, which improves efficiency and takes the guesswork out of the cardiac scan. Additionally, with Booth 3D technology, the Aquilion 64 mobile CT scanner improves image quality by reducing both quantum noise and structured noise in the raw data domain. Refurbished Aquilion 64-slice CT scanners are very popular with cardiac studies, as its software makes a fast and efficient workflow with minimal errors.